← We’re #1 (in Wine Consumption)! Did Andy Warhol ever eat a Primanti Brothers sandwich? As a food-obsessed New Yorker, I’ve pondered this question, on occasion, when visiting my parents in Pittsburgh. Did Andy Warhol ever eat this Manwich? My February 27th New York Times travel article about a new wave of local-minded Pittsburgh restaurants mentions Primanti Brothers as a landmark eatery. Originally a trucker’s joint, Primanti’s opened in the 1930s, serving up its now-famous, mammoth sandwiches stuffed with meat, cheese, coleslaw and French fries. (How those truck drivers stayed awake afterwards is beyond me!). So, it’s possible that Warhol had eaten here; after all, he was born in 1928. And he spent his childhood in South Oakland, a neighborhood bordering the Monongahela River (near downtown) and in relatively close proximity to the Strip District location of the original Primanti Brothers (there are now 17 throughout Pittsburgh). Then again, according to The Warhol Museum, the rail-thin iconic artist was a delicate, sickly child, afflicted with rheumatic fever and Sydenham Chorea, or Saint Vitus’ dance, a neurological movement disorder that can occur with rheumatic fever. Somehow, knowing this (and about his later life penchant for amphetamines), I don’t see him chowing down on this Manwich. I also grew up in Pittsburgh. And my Steel City food memories range from folksy, bastardized Old World—if ponderous—comfort foods, like pirogi, chipped ham sandwiches and Klondike ice cream bars, to restaurant dining that was limited to mostly chain restaurants, like Houlihan’s, Ponderosa and Red Lobster. And Eat ‘n Park, a regional diner where I met college friends for watered-down drip brew and a slice of pie. On a recent visit to Pittsburgh a few months ago, I made a happy discovery: over the last four years, a thriving, local-minded foodie scene—fueled by social media—has erupted. With passion. And with focused enthusiasm. My New York Times article covers this, but there were space constraints. 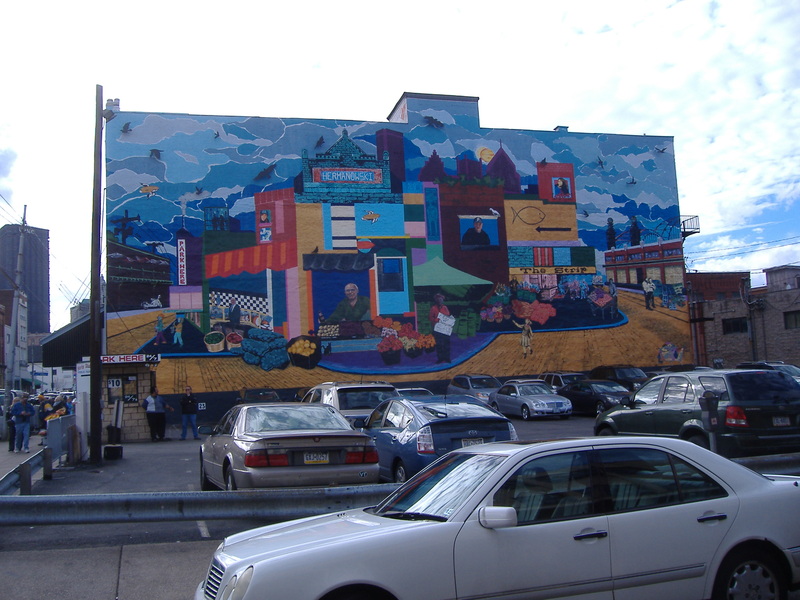 The heart of Pittsburgh’s gullet lies one-half square mile area northeast of downtown Pittsburgh in the Strip District. 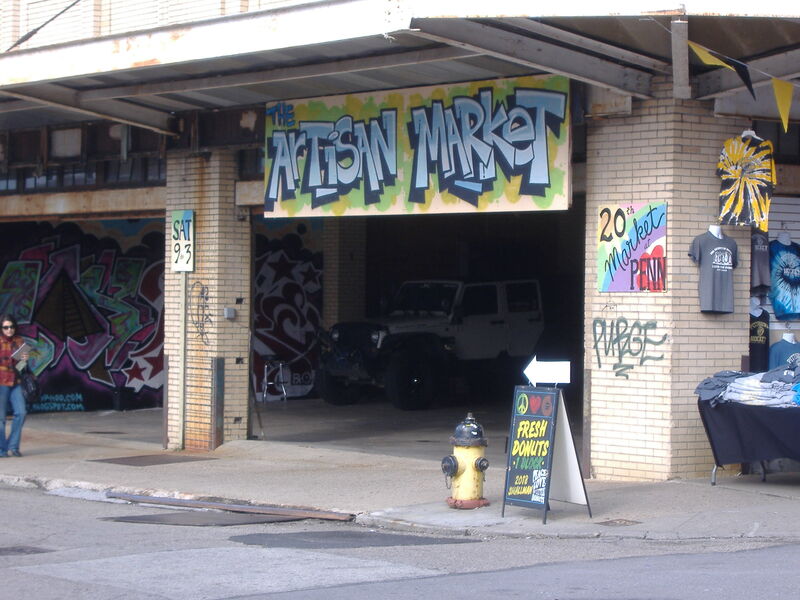 Seasonal farmers’ markets now flourish alongside ethnic food shops and produce retailers and wholesalers in this funky warehouse neighborhood that was the former birthplace of late 19th century industrial giants, like Carnegie Steel Company, Alcoa aluminum company, and Westinghouse Electric Power Company. The Produce Terminal Building, which houses the new Pittsburgh Public Market, was built in 1924 by The Pennsylvania Railroad, enabling trains to unload produce immediately. Eclectic eateries pepper The Strip, including Kaya, an inventive Caribbean-inspired restaurant, helmed by executive chef Sean Ehland, a James Beard Foundation Awards semifinalist in the Rising Star Chef category this year (2011). If you’re jonesing for crispy fish tacos, Jamaican green curry vegetables or jerked pulled pork quesadilla, Ehland won’t disappoint. Even on a Monday evening, Toast! Kitchen and Wine Bar was hopping. Combining their respective areas of expertise, wine director Paul Tebett and chef Chet Garland opened Toast! in Bloomfield (about three miles from the Strip District) a little over two years ago. Their concept: to offer good food and wine at comfortable prices. The vibe of the restaurant, which has a bar, banquettes, exposed wood beams, and artwork-adorned red walls downstairs and three intimate white tablecloth fireside dining rooms upstairs, is resolutely casual and low-key. A daily-changing menu—about 70% locally sourced even in winter— features simple rustic dishes with a southern twang, like black-eyed beans, house-made sausage and local greens (above) and braised wild boar risotto with green tomato salsa. The award-winning wine list features 30 wines by the glass. Given the Scottish, German, Slovak, Polish and Irish ethnic mix of working class immigrants that settled Pittsburgh in the 19th and 20th centuries, Pittsburgh’s food culture has traditionally been one that has favored starch-carbohydrates, meats (especially sausage), cheese and beer. For me, a startling—and delightful—dining revelation was the accessibility of vegetables on restaurant menus. 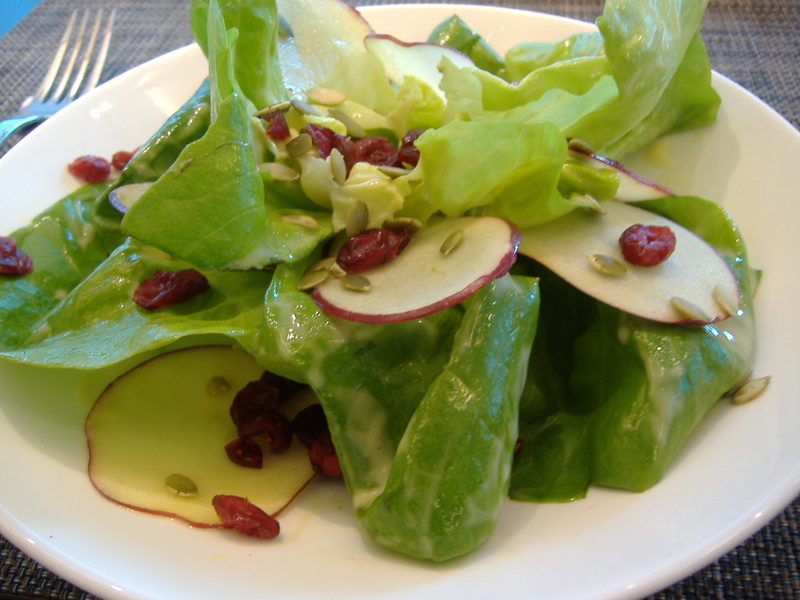 At Habitat in the Fairmont Hotel, I had a beautiful baby bibb salad with toasted hazelnut-dijon dressing (above right). 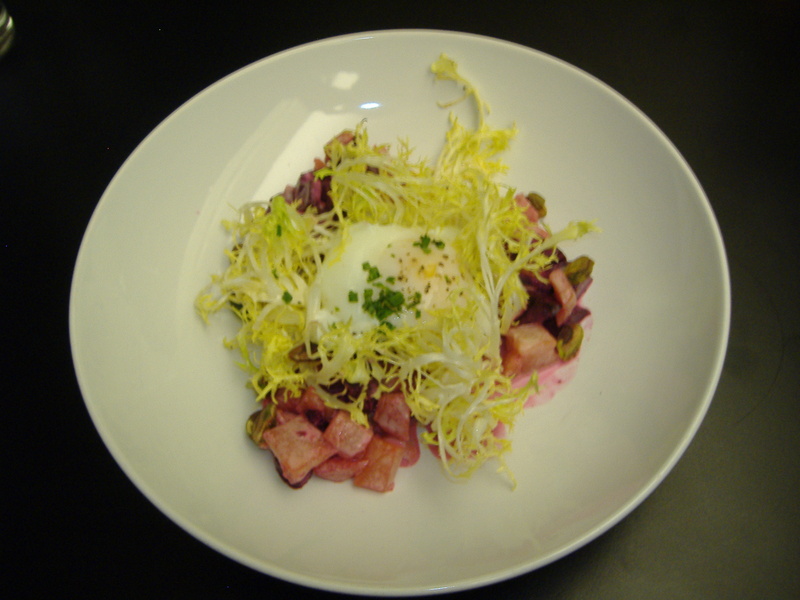 At Salt of the Earth, Chris enjoyed a gorgeous beet and frisee salad lightly perfumed with truffle oil and topped with a poached egg (right). Several salads, featuring local produce, were on offer at Toast!, including black truffles paired with roasted local beets and a rocking smoked trout salad with curly endive. One restaurant that particularly spoke to us was Legume Bistro in Pittsburgh’s Edgewood neighborhood, opened by husband and wife co-owners Trevett and Sarah Hooper in June 2007. The couple’s goal, says Mr. Hooper, a self-taught chef, is to “cook for guests in our restaurant the same way we cook for friends and family at home”. 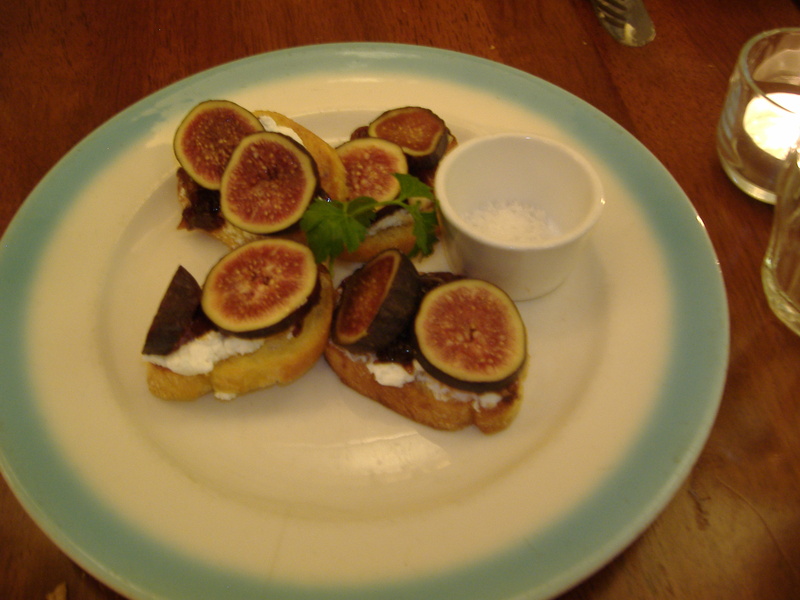 From a delicious starter of fresh fig and goat cheese crostini (left), to a crispy bread crumb crusted duck confit, they succeed. 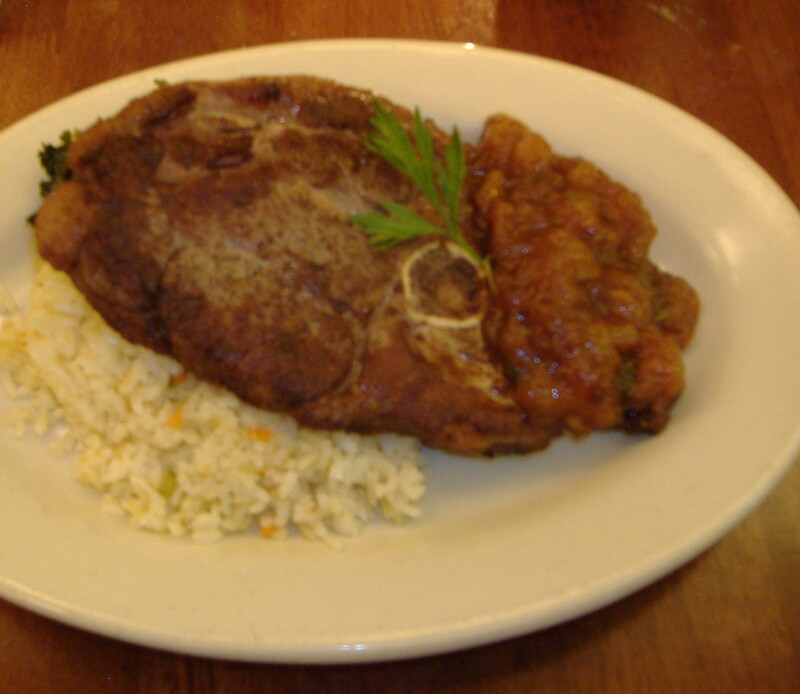 Even in winter, area farmers and purveyors, as well as house-made pickled vegetables and summer-preserved foods, figure prominently in Mr. Hooper’s dishes, like duck liver and quince mousse with yellow bean pickles and Jamison Farm lamb steak (cooked a beautiful medium-rare) with kale and peach chutney (below). My local rockfish, accompanied by dried tomatoes, morita aioli and potato wedges, was fork tender—the perfect antidote to a chilly, late fall evening. And warm, moist, spiced gingerbread, served with poached quince and a dollop of crème fraiche, was a wonderful finale. 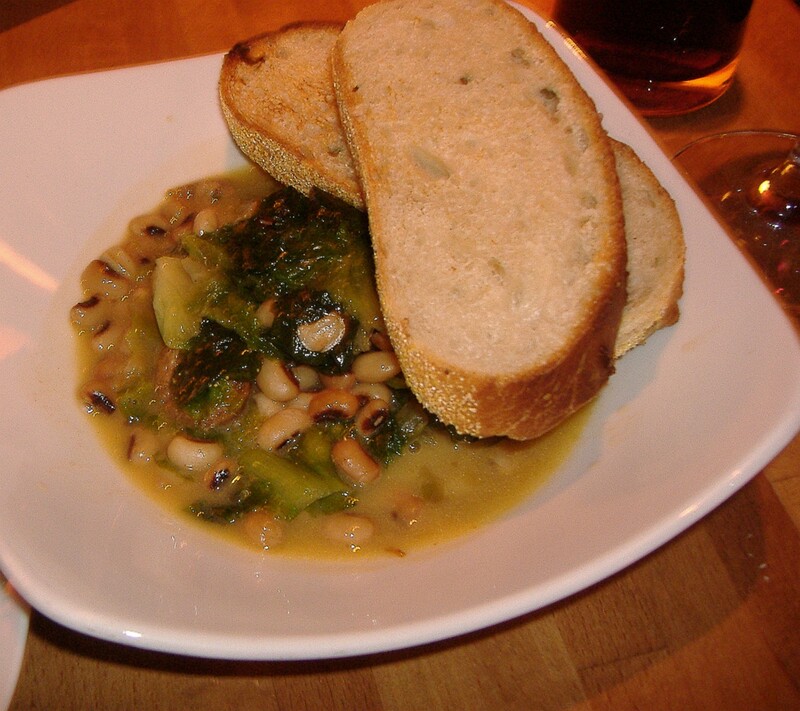 We left Legume, feeling nourished by what felt like a truly home-cooked meal of seasonal, local foods. These days, even Eat ‘n Park, the Pittsburgh-based regional 75-restaurant chain, is trying to shift toward buying more local foods. In 2008, it spent $7.5 million, or 14.2%, on locally sourced foods, according to Jaime Moore, its director of sourcing and sustainability. Local-minded chefs in Pittsburgh are cooking with integrity—and with heart. It’s a trend I’m hoping is here to stay. This entry was posted in Food, Local Food, Restaurants, Travel. Bookmark the permalink.